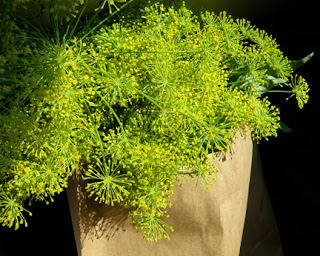 It’s pickling season, and we’ve got fresh dill. If here’s any left over, it’ll make a great potato salad. The dog days of August are about to end (and it can’t come too soon for us). Don’t get us wrong—we much prefer the heat to sloppy wet winter weather, but a few cooler evenings would be nice. You know what we’re saying? We’re told that our latest book, Sausage: A Global History, is scheduled for publication on the fifteenth of September. If only we had learned—in time—that there was a lovely slang term for encased meats in Victorian England. We suspect, however, that the publisher (Reaktion) would never have approved Bags o’ Mystery as a title. Regular subscribers to our updates newsletter receive these updates from our blog, Just Served, directly—but there is much more at the blog that isn’t delivered automatically. You can—if this once-a-month newsletter is just not enough—follow us on Facebook, and Twitter. Still more of our online scribbles can be found at A Quiet Little Table in the Corner. PS: If you encounter broken links, changed URLs—or know of wonderful sites we’ve missed—please drop us a line. It helps to keep this resource as useful as possible for all of us. To those of you who have introduced us to sites like the ones in this newsletter (such as Cara De Silva and Fabio Parasecoli), thanks, and keep them coming! What are Kitchens, Sculleries, and Larders? It’s easy. Whenever you want to shop on Amazon. Com, click on any of the book links below, then whatever you buy there will earn a commission for this newsletter (it doesn’t even have to be one of our books) . The Resource Guide for Food Writers, Update #179 is protected by copyright, and is provided at no cost, for your personal use only. It may not be copied or retransmitted unless this notice remains affixed. Any other form of republication—unless with the author’s prior written permission—is strictly prohibited.